This is a comparative study of cutaneous leishmaniasis (CL) in the Eastern Province of the Kingdom of Saudi Arabia and Sudan. The disease in both countries is caused by Leishmania major of different syndromes and the vector is Phlebotomus papatasi. The animal reservoir host in Saudi Arabia is Psammomys obesus and the Nile rat in Sudan. 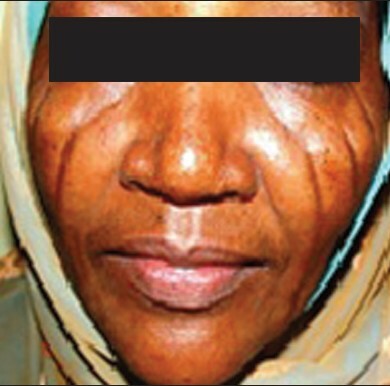 The clinical manifestations are similar, but some forms encountered in Sudan were not seen in Saudi Arabia. The pathology, immunology, diagnosis and treatment of CL are discussed. تعرض هذه الدراسة مقارنة للشمانيا الجلدية في واحة الاحساء بالمنطقة الشرقية بالمملكة العربية السعودية وجمهورية السودان. يسبب المرض في كلا البلدين طفيلي اللشمانيا ميجر وناقل واحد وهو ب.باباتازي. الحاضن الحيواني للمرض في السعودية هو سامومى اوبيسس وفي السودان جرذان النيل. تتشابه الأعراض السريرية في البلدين ولكن بعض أشكال المرض خاصة بالسودان ولاتوجد في المملكة العربية السعودية. تناقش هذه الورقة باثولجيا المرض ومناعياته وكيفية تشخيصه وعلاجه. Cutaneous leishmaniasis (CL) of the Old World is caused by different parasites that include Leishmania major, Leishmania tropica and Leishmania aethiopica. The clinical manifestations, the vector, the pathology and response to the treatment vary widely depending on the types of parasite and the clinical manifestations. This article compares various aspects of CL caused by L. major in the Al-Ahsa Region of the Eastern Province of the Kingdom of Saudi Arabia and Sudan. It will be shown that the parasites in Sudan and Saudi Arabia are L. major of different zymodermes. The vector in both countries is Phlebotomus papatasi and the reservoir of the parasite is Psammomys obesus in Al-Ahsa and the Nile rat in Sudan. The clinical manifestations and the pathology are similar in the two countries, but some differences have been documented. This article is based on the author's experience of work undertaken in both Saudi Arabia and Sudan. The Al-Ahsa Oasis is the largest natural oasis in Saudi Arabia and all of Asia. It is located just over 40 miles (65 km) west of the Arabian Gulf and measures 30,000 acres (12,000 hectares). Over 60 artesian springs, as well as a large underground aquifer (Encyclopedia Britannica) feed the Oasis. Collectively, these provide water for the million residents and irrigation for over 3 million date palms in the area. In addition to palm trees, the Oasis has abundant wild vegetation, including Chenopod which is the only plant that P. obesus feeds on. Besides, indigenous population, there is a sizable number of people from Asia and the Arab World. The endemic areas for CL in Sudan are Kordofan, Darfur in the west and an area in the north along the main Nile. Cases of CL have been described by several authors in Sudan since 1911. ,,,, These were usually single cases and the parasite was not typed. In the 1970s and 1980s, two major epidemics of CL have occurred in Sudan including Khartoum. The first epidemic on record started in 1976 in the Shendi-Atbara area  consistent with a newly-introduced disease in a non-immune population. All the groups were affected. During the epidemic, the incubation period of CL varied from 2 to 4 weeks in the majority of cases. Another outbreak started in Tuti island of Khartoum district in 1985. The disease spread across north and south of Khartoum district and is now endemic in almost all the rural and urban areas of Sudan with the exception of South Sudan. Children are the most affected in the prevailing endemic areas. In a report on the clinical manifestations of CL due to L. major in Aljisha village in the Al-Ahsa Oasis, the disease was described as slowly evolving inflammatory lesion(s) that are nodular, noduloulcerative or ulcerative that heals spontaneously with scar(s) in 3-12 months. Features of diagnostic value were identified and their approximate frequency determined in a selected group of 475 patients.­  These features were: Exposed location site, pairing or clustering of lesions, skin crease orientation, volcanic nodules, satellite papules, subcutaneous nodules and "iceberg" nodules. A combination of three or more of these forms also occurred in Sudan and had the same diagnostic value [Figure 1], [Figure 2], [Figure 3], [Figure 4]. Lymph node enlargement was documented in both Sudan and Saudi Arabia. The affected lymph nodes were generally solitary in form, firm, mobile, non-tender, only moderately enlarged appearing to persist beyond the associated skin lesions. The basic clinical manifestations of CL in Sudan are similar to those in Al-Ahsa with a few differences. Some features reported in Sudan were not described in Saudi Arabia [Figure 5], [Figure 6], [Figure 7], [Figure 8], [Figure 9], [Figure 10]. 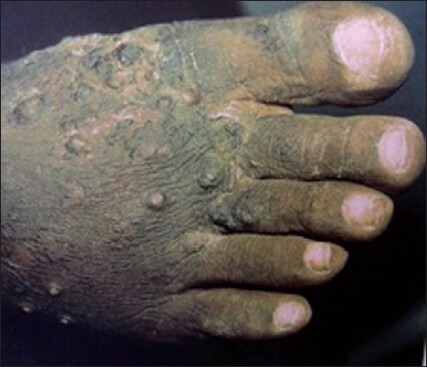 The less common clinical forms in Sudan included Leishmanial dactylitis which is due to infiltration of the back of the finger or toe by parasites and chronic inflammatory cells. 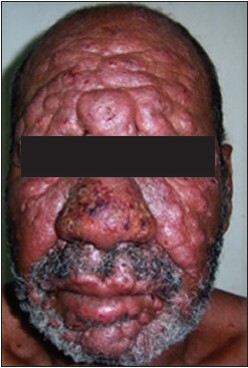 Mycetoma-like lesion is characterized by multiple papules and nodules resembling mycetoma (maduromycosis) Some Sudanese patients developed thick infiltrative lesions and nodules in the face and other parts of the body, which were usually mistaken for leprosy [Figure 6]. 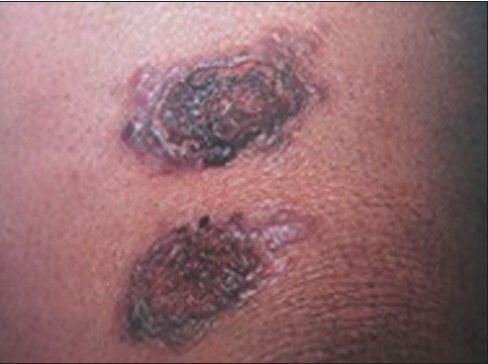 Recidivans-like lesions are due to L. major were reported in two patients who presented with lesions consisting of a central scar and an active ulcerated growing edge [Figure 7]. However, they differed from recidivans lesions due to L. tropica in that the lesions did not heal first by scarring followed by recurrence in the scar. The healing and ulceration developed simultaneously, a feature that was not previously described in zoonotic CL due to L. major. Leishmaniasis in the nose was characterized by an ugly crusted lesion [Figure 8] and [Figure 9]. 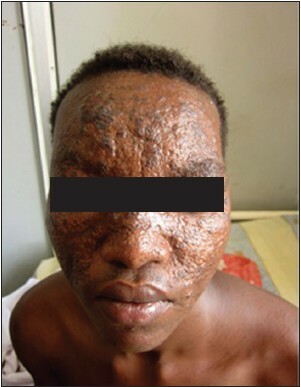 We recently published a case of CL from Darfur in an 18-year-old male who had extensive lesions in the face from the age of 1 year [Figure 10]. The parasite was typed as L. major and he responded dramatically to intravenous Pentostam. After the first survey mentioned above,  another major survey of the phlebotomine fauna in a focus of ZCL in the Al-Ahsa Oasis, revealed only one species of Phlebotomus (P. papatasi) and three of Sergentomyia (S. antennata, S. clyde and S. fallax). Eleven specimens of P. papatasi from six sites in the oasis were found to have promastigotes in the midgut. An isolate from one of the sandflies was typed by the examination of isoenzymes and was identified as L. major, zymodeme LON-4 (=Montpellier zymodeme 26), the principal zymodeme of L. major isolated from patients with ZCL in the oasis. Three isolates from leishmania lesions at the sites of the bites of wild specimens of P. papatasi were also identified as the same zymodeme of L. major as the isolate from the sandfly. The pathology of leishmaniasis in Saudi Arabia and Sudan are essentially the same, despite the different zymodemes of the parasites. We used Ridley's classification system to classify material from Sudan and Saudi Arabia. There were some differences between our system of classification and Ridley's. Lesions in Sudan and Saudi Arabia could be grouped into five types: A, B, C, D and E. Type A, which was the least common, consisted of sheets of macrophages containing many parasites. Lymphocytes and plasma cells were few. Type B consisted of macrophages, lymphocytes, plasma cells, but unlike Ridley's Type B, there was no obvious necrosis of individual macrophages. Despite this difference, we retained Ridley's Type B nomenclature. Type C showed focalized areas of necrosis. The necrosis affected large numbers of parasitized macrophages. When this occurred near the epidermis, it caused ulceration. We identified a new type that we called Type D. It was composed of a heavy lymphocytic infiltrate, activated macrophages, poorly-formed granulomas and scanty parasites. Patients with this reaction had an exaggerated Leishmanin skin response, reaching 17 mm in diameter. Type D was uncommon in Sudan and Al-Ahsa. Type E consisted mainly of well-formed epithelioid granulomas with a virtual absence of plasma cells and relatively scanty lymphocytes. Subcutaneous nodules showed necrosis associated with neutrophils. Histologically, the nodes draining skin lesions showed follicular hyperplasia with prominent germinal centers and expansion of the paracortex. Necrosis was seen in some lymph nodes. Parasites were scanty or not demonstrable in these nodes, although Leishmania antigen was found in the follicular dendritic cells and interdigitating cells of the paracortex. Elimination of parasites in CL involves 2 mechanisms. , The first is a necrotizing process in which the macrophage and the parasites it contains are destroyed. In the second, the macrophage is activated by T. lymphocytes to destroy the parasite in intact macrophages through the production of interferon by the T. cells. Tumor necrosis factor Alpha was considered to play a central regulatory cytokine in the introduction of macrophage antimicrobial activities.­ , In an ultrastructural study, Veress et al. showed that parasites were destroyed in activated macrophages. El-Hassan et al. reported on the cell phenotypes in lesions of CL caused by L. major. T-cells were abundant in CL lesions. In an active lesion, the majority of T-cells were T-helper cells or the T-helper and T. suppressor cells were present in almost equal numbers, while in a regressing lesion, the majority was of the CDB cytotoxic/suppressor phenotype. Material from the lesion can be inoculated into NNN medium, Schneider's insect medium or other media. The major limiting factor is bacterial and fungal contamination. This can best be overcome by inoculating the material into hamsters of BALB/c mice. Complement fixation, hemagglutination, indirect fluorescence test, immune-electrophoresis and enzyme-linked immunosorbent assay (ELISA) have been used, but were found to be of little value in the diagnosis of CL. The direct agglutination test and ELISA were used in patients with a CL from Sudan, but were also found to be of no diagnostic value. An ELISA using a 28 amino acid sequence of the repetitive element of gene B protein (GBP) from L. major was developed for serodiagnosis of CL. The sensitivity of the test was 82%, higher than ELISA using crude amastigote or promastigote antigens. Significantly higher levels of antibodies were found in Sudanese patients who had the disease for more than 8 weeks than in patients with a shorter clinical history. The test was negative in healthy normal controls and in patients with malaria. It was concluded that the GBP ELISA could be used as a supplementary test in the diagnosis of CL. It can be used to support a provisional diagnosis in early disease and to confirm it in those with a history of more than 8 weeks. Using the polymerase chain reaction (PCR), L. major was identified in material from Sudanese patients with a CL. Direct microscopy of slit smears or histological sections to demonstrate L. major parasites in Sudanese patients with CL was compared with the PCR in frozen sections from the same patients. PCR had a sensitivity of 86% when used alone and 93% when combined with Southern blotting. In contrast, microscopy of histological sections had a sensitivity of 76% and microscopy of slit and impression smears were only 55% and 48% sensitive, respectively. PCR had the added advantage of identifying the species of the parasite. This is carried-out by the intradermal injection of killed promastigotes. The test is read 48-72 h later. A positive reaction is an induration of 5 mm or more. The test is of little value in the diagnosis of individual cases, but is useful in epidemiological surveys. A study tested the efficacy of zinc phosphide and fenacoum against the reservoir host P. obesus rat. The results showed that both the rodenticides were significantly (P < 0.01) effective in reducing the number of active holes during 1 year of application. It is doubtful if this was followed by a significant reduction in the number of cases in the population. There is no control program in Sudan. *In memory of the late Dr. Sabir Elbihari: A great Parasitologist and a wonderful person. The author is indebted to Dr. Haim Mohammed, Research Assistant at the Institute of Endemic Diseases, University of Khartoum, for helping with the references. 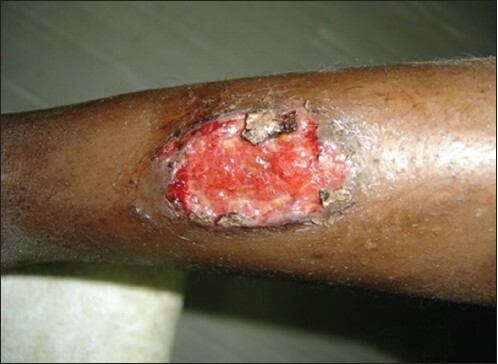 1. WHO cutaneous leishmaniasis in Saudi Arabia. Available from: http://www.emro.who.int/pdf/zoonoses/countries/cl-saudi.pdf. 2. Killick-Kendrick R, Leaney AJ, Peters W, Rioux JA, Bray RS. Zoonotic cutaneous leishmaniasis in Saudi Arabia: The incrimination of Phlebotomus papatasi as the vector in the Al-Hassa oasis. Trans R Soc Trop Med Hyg 1985;79:252-5. 3. Al-Gindan Y, Kubba R, Abdul-Aziz O. Cutaneous leishmaniasis in Al-Hassa: clinical comparison between Saudi and non-Saudi patients. The 6 th Annual Saudi Medical Meeting, 15-18, March. Jeddah: Faculty of Medicine and Allied Sciences, King Abdulaziz University; 1981. 4. Thompson DB, Balfour A. Two cases of nonulcerating 'oriental sore', better termed Leishmania nodules. Trans R Soc Trop Med Hyg 1910;3:105-28. 5. Archibald RG. A case of parasitic granuloma in which developmental forms of Leishmania tropica were present. Fourth Report of the Wellcome Tropical Research Laboratories at the Gordon Memorial College, Khartoum. 1911. p. 207-11. 6. Christopherson JB. On a case of naso-oral leishmaniasis corresponding to the description of espundia, and a case of oriental sore, both originating in the Anglo-Egyptian Sudan. Ann Trop Med Parasitol 1914;8:485-96. 7. Kirk R, Drew CB. Preliminary notes on dermal leishmaniasis in Anglo-Egyptian Sudan. Trans R Soc Trop Med Hyg 1938;32:265-70. 8. Kirk R. Studies in leishmaniasis in the Anglo-Egyptian Sudan. V. Cutaneous and mucocutaneous leishmaniasis. Trans R Soc Trop Med Hyg 1942;35:257-70. 9. Abdalla RE, Ali M, Wasfi AI, el-Hassan AM. Cutaneous leishmaniasis in the Sudan. Trans R Soc Trop Med Hyg 1973;67:549-59. 10. el-Safi SH, Peters W. Studies on the leishmaniases in the Sudan. 1. 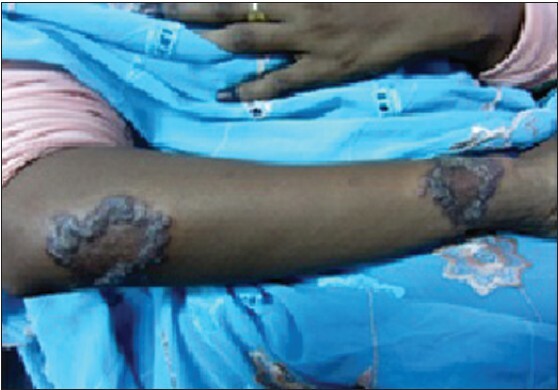 Epidemic of cutaneous leishmaniasis in Khartoum. Trans R Soc Trop Med Hyg 1991;85:44-7. 11. Kubba R, Al-Gindan Y, el-Hassan AM, Omer AH. Clinical diagnosis of cutaneous leishmaniasis (oriental sore). J Am Acad Dermatol 1987;16:1183-9. 12. el-Hassan AM, Zijlstra EE. Leishmaniasis in Sudan. Cutaneous leishmaniasis. Trans R Soc Trop Med Hyg 2001;95 Suppl 1:S1-17. 13. al-Gindan Y, Kubba R, el-Hassan AM, Omer AH, Kutty MK, Saeed MB. Dissemination in cutaneous leishmaniasis. 3. Lymph node involvement. Int J Dermatol 1989;28:248-54. 14. Gaafar A, Fadl A, el Kadaro AY, el Hassan MM, Kemp M, Ismail AI, et al. Sporotrichoid cutaneous leishmaniasis due to Leishmania major of different zymodemes in the Sudan and Saudi Arabia: A comparative study. Trans R Soc Trop Med Hyg 1994;88:552-4. 15. Kadaro AY, Ghalib HW, Ali MS, Eltoum I, Ismail A, Gaafar A, et al. Prevalence of cutaneous leishmaniasis along the Nile River north of Khartoum (Sudan) in the aftermath of an epidemic in 1985. Am J Trop Med Hyg 1993;48:44-9. 16. Elamin EM, Guerbouj S, Musa AM, Guizani I, Khalil EA, Mukhtar MM, et al. Uncommon clinical presentations of cutaneous leishmaniasis in Sudan. Trans R Soc Trop Med Hyg 2005;99:803-8. 17. El Hassan AM, Khalil EA, Elamin WM, El Hassan LA, Ahmed ME, Musa AM. Misdiagnosis and mistreatment of post-kala-azar dermal leishmaniasis. Case Rep Med 2013;2013:351579. 18. Elbihari S, Kawasmeh ZA, Al-Naiem A, Al-Atiya S. Leishmania infecting man and wild animals in Saudi Arabia. 3. Leishmaniasis in Psammomys obesus Cretzschmar in Al-Ahsa oasis. Trop Med Parasitol 1987;38:89-92. 19. Badi M. Animal reservoir of cutaneous leishmaniasis in Khartoum. [MSc]. Thesis: University of Khartoum; 1990. 20. Salah Eldin H. Cutaneous leishmaniasis in Tuti Island, Khartoum, Sudan: A cross sectional study of school children and a sample of the population. [MSc]. Thesis: University of Khartoum; 1997. 21. Gaafar A, el Kadaro AY, Theander TG, Permin H, Ismail A, Kharazmi A, et al. The pathology of cutaneous leishmaniasis due to Leishmania major in Sudan. Am J Trop Med Hyg 1995;52:438-42. 22. Nacy CA, Fortier AH, Meltzer MS, Buchmeier NA, Schreiber RD. Macrophage activation to kill Leishmania major: Activation of macrophages for intracellular destruction of amastigotes can be induced by both recombinant interferon-gamma and non-interferon lymphokines. J Immunol 1985;135:3505-11. 23. Nacy CA, Meierovics AI, Belosevic M, Green SJ. Tumor necrosis factor-alpha: Central regulatory cytokine in the induction of macrophage antimicrobial activities. Pathobiology 1991;59:182-4. 24. Veress B, Abdalla RE, El Hassan AM. Electron microscope investigations on leishmaniasis in the Sudan: II. Ultrastructural morphology of macrophage-parasite interaction in human and hamster macrophages in vivo. Ann Trop Med Parasitol 1981;75:607-13. 25. El-Hassan AM, Kubba R, Al-Gindan YM, Omer AH, Kutty MK, Saeed MB. Lymphocyte phenotypes and HLA-DR expression in lesions of cutaneous leishmaniasis and their draining lymph nodes. Ann Saudi Med 1987; 7(3) 212-20. 26. ElHassan AM, Gaafar A, Theander TG. Antigen-presenting cells in human cutaneous leishmaniasis due to Leishmania major. Clin Exp Immunol 1995;99:445-53. 27. Gaafar A, Kharazmi A, Ismail A, Kemp M, Hey A, Christensen CB, et al. Dichotomy of the T cell response to Leishmania antigens in patients suffering from cutaneous leishmaniasis; absence or scarcity of Th1 activity is associated with severe infections. Clin Exp Immunol 1995;100:239-45. 28. Griffiths WA, Dutz W. Repeated tissue sampling with a dental broach. A trial in cutaneous leishmaniasis. Br J Dermatol 1975;93:43-5. 29. Kubba R, Al-Gindan Y. Leishmaniasis. Dermatol Clin 1989;7:331-51. 30. Ridley DS, Ridley MJ. The evolution of the lesion in cutaneous leishmaniasis. J Pathol 1983;141:83-96. 31. Manson-Bahr PH. Diagnosis. In: Peters W, Killick-Kendrick R, editors. The Leishmaniases in Biology and Medicine. Vol. 2. London: Academic Press; 1987. p. 703-29. 32. el-Safi SH, Peters W, el-Toam B, el-Kadarow A, Evans DA. Studies on the leishmaniases in the Sudan. 2. Clinical and parasitological studies on cutaneous leishmaniasis. Trans R Soc Trop Med Hyg 1991;85:457-64. 33. Jensen AT, Gaafar A, Ismail A, Christensen CB, Kemp M, Hassan AM, et al. Serodiagnosis of cutaneous leishmaniasis: Assessment of an enzyme-linked immunosorbent assay using a peptide sequence from gene B protein. Am J Trop Med Hyg 1996;55:(5);490-5. 34. Andresen K, Gaafar A, El-Hassan AM, Ismail A, Dafalla M, Theander TG, et al. Evaluation of the polymerase chain reaction in the diagnosis of cutaneous leishmaniasis due to Leishmania major: A comparison with direct microscopy of smears and sections from lesions. Trans R Soc Trop Med Hyg 1996;90:133-5. 35. Urcuyo FG, Zaias N. Oral ketoconazole in the treatment of leishmaniasis. Int J Dermatol 1982;21:414-6. 36. Kubba R, Al-Gindan Y, El-Hassan AM, Omer AH. Ketoconazole in cutaneous leishmaniasis: Results of a pilot study. Saudi Med J 1986;7:596-604. 37. Momeni AZ, Jalayer T, Emamjomeh M, Bashardost N, Ghassemi RL, Meghdadi M, et al. Treatment of cutaneous leishmaniasis with itraconazole. Randomized double-blind study. Arch Dermatol 1996;132:784-6. 38. El Hassan AM. Treatment of cutaneous leishmaniasis. Sudan Med J 1987; Special Issue; El-Hassan et al.:11. 39. el-On J, Halevy S, Grunwald MH, Weinrauch L. Topical treatment of Old World cutaneous leishmaniasis caused by Leishmania major: A double-blind control study. J Am Acad Dermatol 1992;27:227-31. 40. Bassiouny A, El Meshad M, Talaat M, Kutty K, Metawaa B. Cryosurgery in cutaneous leishmaniasis. Br J Dermatol 1982;107:467-74. 41. Al-Gindan Y, Kubba R, Omer AH, el-Hassan AM. Cryosurgery in old world cutaneous leishmaniasis. Br J Dermatol 1988;118:851-4. 42. Al-Mohammed HI. Efficacy of two rodenticides against Leishmania reservoir host rat (Psammomys obesus) in the rural area of Al-Ahsa Oasis, Saudi Arabia. J Egypt Soc Parasitol 2010;40:609-16.